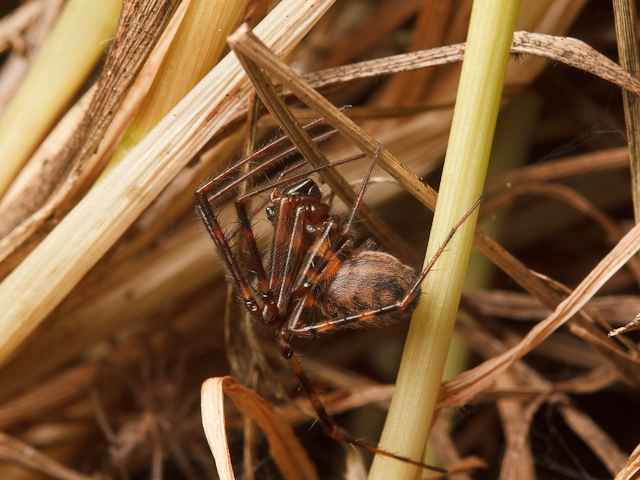 Spring is springing in Victoria, and it’s a great time to see spiders. Sean insisted that I take a break from the intense data-wrangling I was working on yesterday afternoon to take a walk at Mount Tolmie. 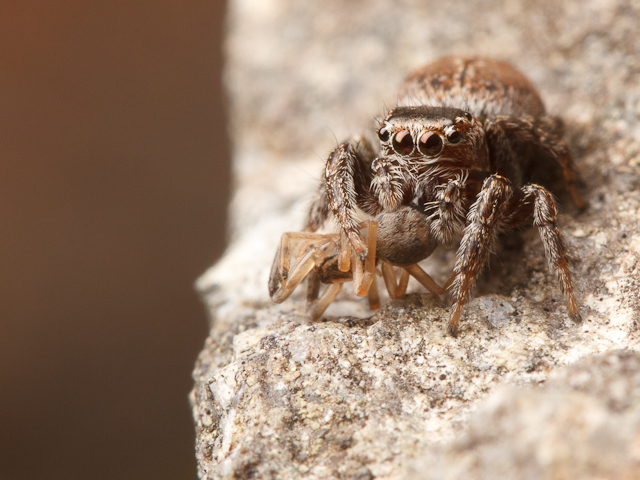 We were rewarded with an amazing abundance and diversity of spiders, just by flipping over a few rocks. Here is a selection of our most exciting finds, by family. Our adventure began with another observation of spider-on-spider predation. This lovely reddish jumping spider’s victim is unknown – perhaps a sac spider (family Clubionidae). Pimoa altioculata. 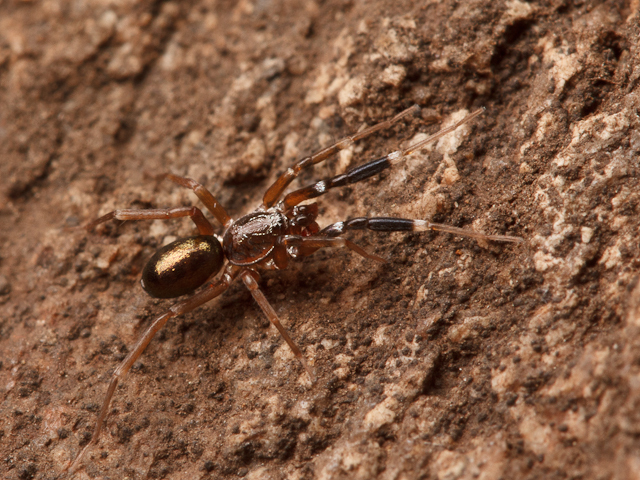 Pimoidae is a family of spiders that is closely related to the Linyphiidae, and one I have never before encountered. The name Pimoa comes from the Gosiute language, and means ‘big legs’. An rather apt description for this leggy spider, found hanging out near a couple of egg sacs. Alopecosa – named for a fox. 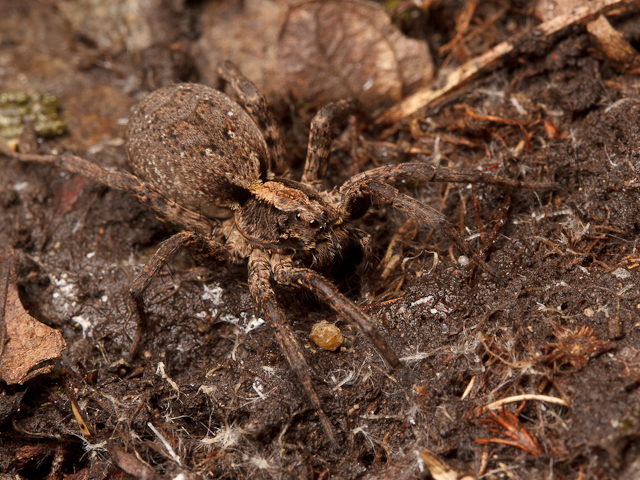 We found several of these gravid (pregnant) wolf spiders under the stones. This one was hiding out in a burrow. 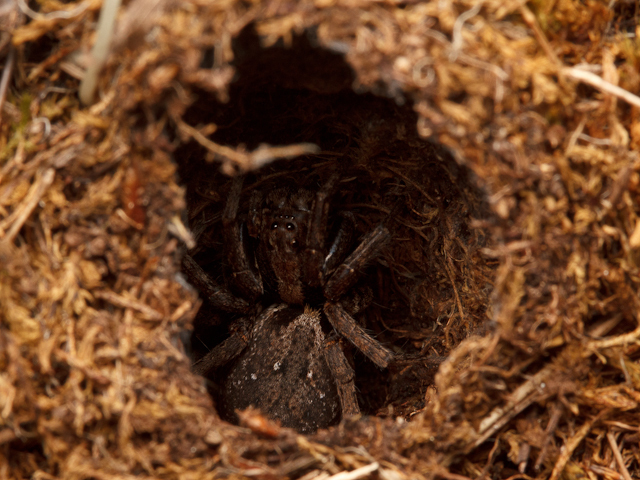 A ground spider with its characteristic cylindrical spinnerets visible. 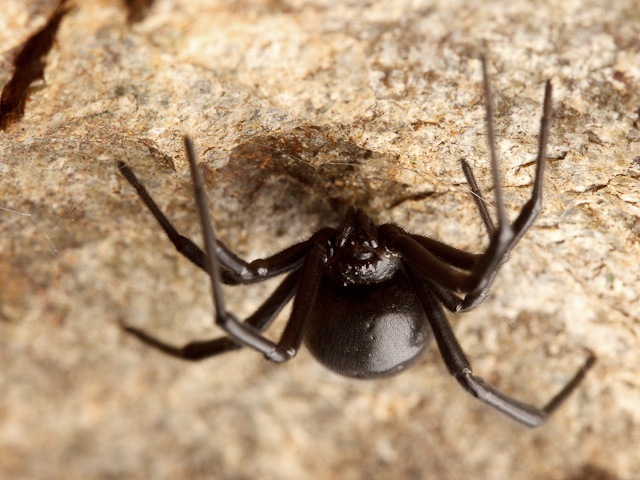 The western black widow, Latrodectus hesperus, can usually be found under the rocks at Mount Tolmie. They are not nearly as abundant there as at Island View Beach, however. The prize of the day was Phrurotimpus borealis. Phrurotimpus means ‘guarder of stones’, in reference to their habit of dwelling under rocks. 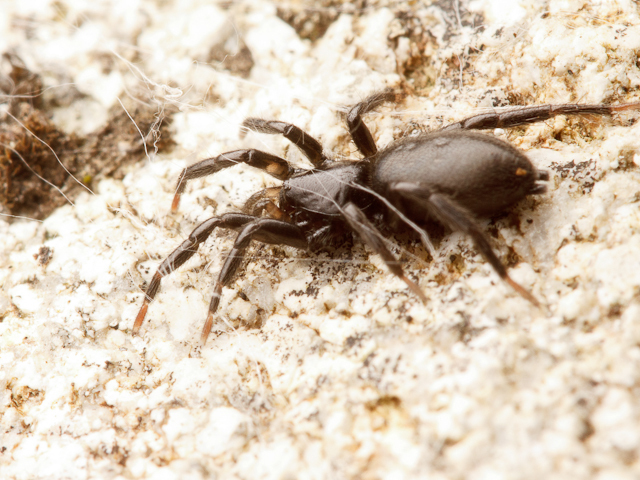 These tiny spiders are ant-mimics, with the first pair of legs held forward like antennae (ants are also abundant under the rocks at Mount Tolmie). This one is a mature male. 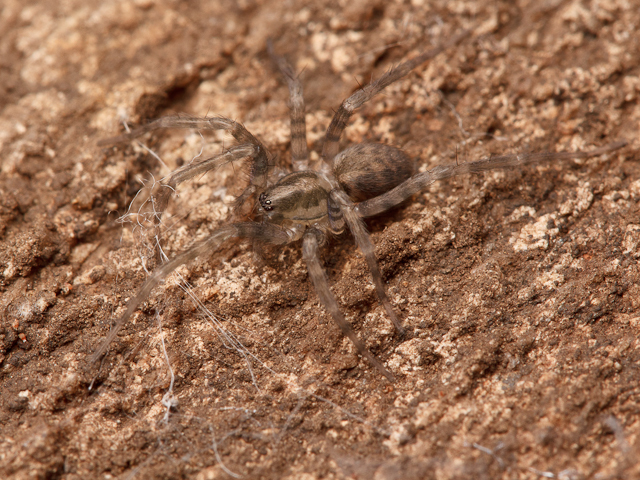 Finally, a mystery spider that we initially mistook for an amaurobiid. 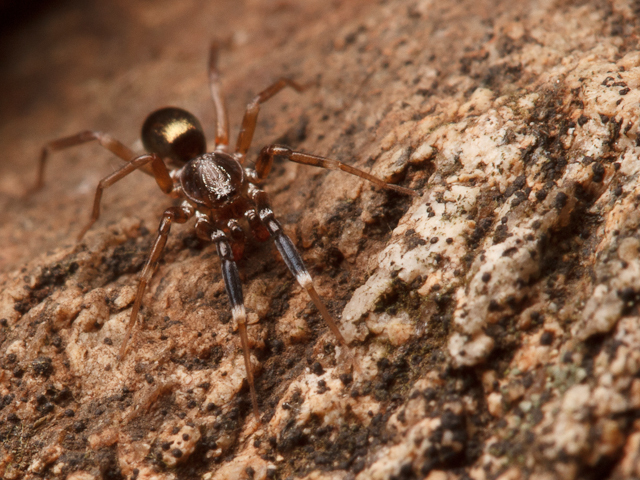 Not shown, but also encountered, were many Tegenaria (some of which are now Eratigena) (Agelenidae) and a pair of Dysdera crocata (Dysderidae). At least nine families is not too shabby for an impromptu afternoon stroll! Many thanks to Robb Bennett for his kind help with identification.